Sweet Sweat in Summer Now Available for Pre-order! Ammolite’s Sweet Sweat in Summer: The Naughty Girl and Her Ripe Scent is now available for pre-order! Sweet Sweat will be available for download on July 31st. Order your copy of this steamy, summer romance now to get it at 10% off! Follow Kouhei on his summer trip back to his hometown which he finds as curiously empty as his own memories of the place. All alone in the otherwise abandoned town, he meets a girl, Karin, and the two indulge themselves in the secluded summer atmosphere of the town. And I was returning to the town I was born in. A totally normal thing to do, but it was a bit different for me. …You see, I had no memory of actually living here. It wasn’t really that big of a deal. It’s not exactly unheard of to lose some of your memories in a car accident or something like that. So, because of that, this homecoming was more like a little vacation. I didn’t encounter anyone even though I had been walking for ages. It was terribly quiet, and it didn’t seem like anyone was even around. The gate was wide open, even though all the students and staff must have been on summer vacation. …But, given that the gate was open, it meant that someone must have been around.ÅAI’d just ask if they knew of a place I could stay at, and… Wait a second. If I were to go into the school just like that, I’d be trespassing. Whoever was around would surely understand my actions when I explained my situation. –My mind froze the moment I saw her. 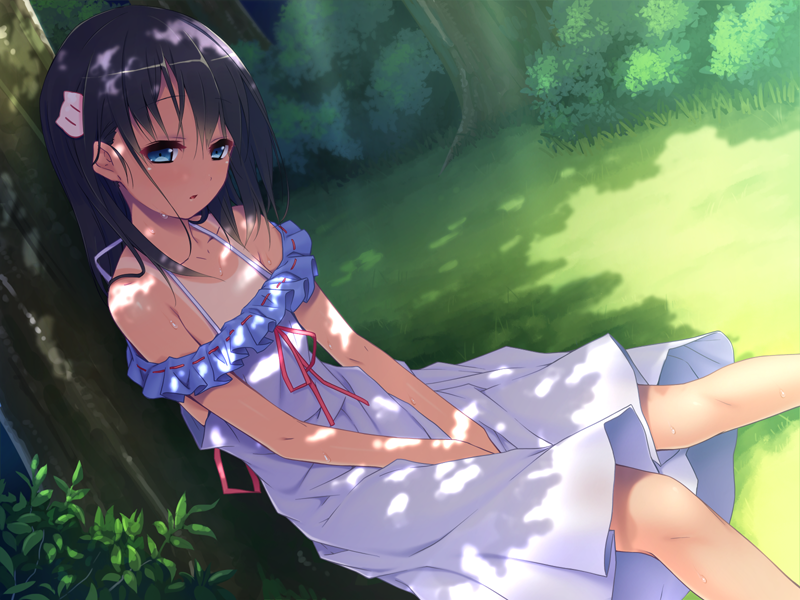 An adorable girl sleeping beside a tree. A sun that shone down on her innocent features, illuminating the tone of her healthy skin, which looked strikingly vivid in contrast with the shade. Her figure was childish, but had enough curve to it to make it undoubtedly feminine and uniquely risque. It was as though her body had just taken its first step in the long process of maturing from girl to woman. A town where nobody lives… Is he dead?